After an extremely productive few days fishing on the Maeklong River with the Fishsiam team and landing possibly the largest freshwater fish ever caught on rod and line Ian visited the highly productive Topcats fishery in Koh Samui. Ian started his session with method fishing tactics in an attempt to capture one of the numerous carp species which reside in the lake. Ian fished with 4oz Fox method feeders loaded with Topcats specialist groundbait with super sharp owner hooks popped up with rig foam. Both rods were fished to a previously productive area which had been heavily baited with groundbait and particles. It was not long before Ian was into the first fish of the session with a lively young Redtail Catfish being quickly brought to the waiting net. The fish was estimated to weigh 15kg’s and was identified as being one a fish stocked eighteen months previously at a weight of 2kg’s! After quickly releasing the fish it didn’t take long before Ian was into another hard fighting fish which proceeded to tear up and down the length of the lake. After a short ten minute battle the Director of the Carp Society in the UK soon had the fish in the net. A quick glance confirmed that Ian had caught his first Giant Siamese Carp in Thailand of an estimated 30lb’s. After a few trophy shots the fish was lovingly returned back into the lake. 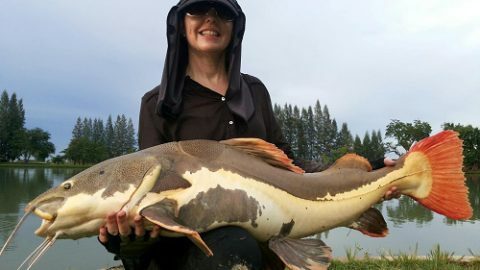 The session continued to produce further action seeing the Anglers Mail reporter land several more Giant Siamese Carp and Mekong Catfish. At the end of the highly productive days angling Ian had bagged a twelve fish haul consisting of Giant Siamese Carp, Mekong Catfish, Redtail Catfish with weights upto an estimated 30kg’s.